16 Etchells came to the start line for the 2018 Saida Cup over the weekend of 12 / 13 May with the fleet based out of Cowes Yacht Haven and racing run by RO Phil Hagen and his team from the Royal Thames Yacht Club. After the incredibly successful Salsa dancing class this Spring, we have organised a five week beginners Salsa Dancing Course for all ages, couples and individuals in 2018! Click here for further information including dates and to book your spot. We welcome all Members to the annual Sailing Forum on the 9th January. 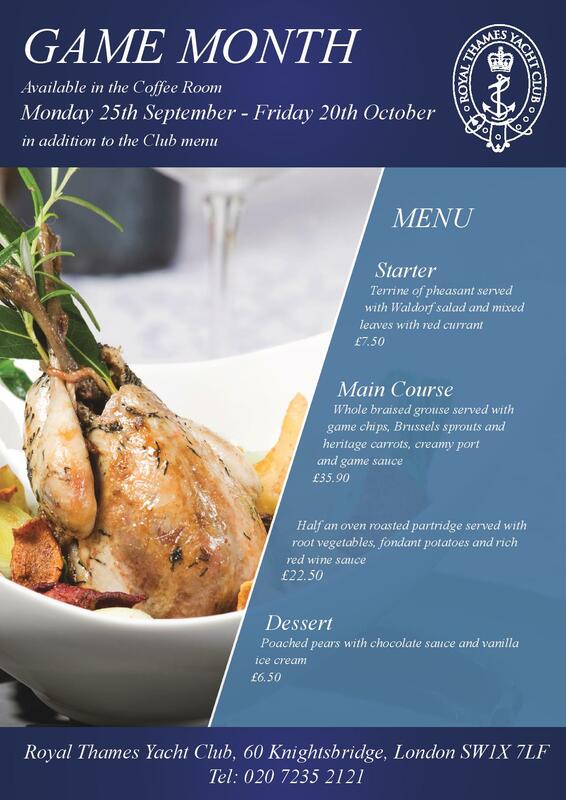 Click here to view the new Club menu in the Coffee Room. Members are reminded that the Club will close for Christmas after lunch service on Friday 22nd December and will re-open on Tuesday 2nd January 2018. We would like to take this opportunity to wish all our Members a Happy Christmas! Click here to read the Winter Newsletter online. Warm yourself up with a George Christmas Punch. Click here to view the flyer. Another crazy weather day at the 2017 Busan Cup Women's International Match Race, the penultimate event of the 2017 Women's International Match Racing Series. The cold winds whipped around in all different directions as the finals were played out in the waters off Dongbaek Island. Vote for Fiona Hampshire - Royal Thames Academy, nominated by Yachts and Yachting, to win 'Amateur Sailor of the year'. Three new Academy teams enjoyed a great weekend of team racing at the Oxford Magnum over the weekend. Always the premier competition of the autumn, there was a strong showing of both university and alumni teams, with many Royal Thames members present. Click here to view the fortnightly Coffee Room Menu. An enjoyable evening of fine dining and excellent conversation. There will be a three course dinner with a glass of bubbly on arrival, offered to anyone who has cruised or dipped their toe in this year’s rallies or for those generally interested in any future cruising events. Everyone is welcome, bring along your guests and prepare for an evening of fun. Congratulations to Team Captain Andy Cornah and his team for their victory at the 13th Annual Lee Trophy. Members are reminded that the Club is open for business on Friday evenings when smart casual, including clean and tidy jeans, is the dress code from 4pm. The Britannia Bar is open until 11pm and the Coffee Room is open for dinner 7.30pm to 9pm (last orders). Smart casual dress code including jeans is permitted in the Coffee Room on Friday nights. At the Annual General Meeting of the Royal Thames Yacht Club Limited held at 60 Knightsbridge on Wednesday 1 November 2017 the following were elected to serve as Flag Officer from 1 November 2017. To view the minutes of the 2017 AGM please click here. It will not be possible to prepare any hot food for lunch on Friday 3rd November and the Coffee Room will be closed for lunch but sandwiches and cold bar snacks will be available in the Britannia Bar. The kitchen should be back in operation by 4pm that day and the Coffee Room will be open for dinner that evening. The famous Curry Night is back. Book your table in the Coffee Room today to avoid disappointment. Click here to view the menu. Bookings can be made through reservations. Click here to read a report from the Team Manager William Edwards. In previous years the Game Week in the Coffee Room has been such a success the Club have deicded to run the themed Game Menu for a month this year. Click here to view the menu. Bookings are advised through reservations or call on 020 7201 21 21. Why not enjoy a 'The George Special' in the Britannia Bar throughout September. Click here to view the flyer. The Club is once again welcoming St Francis YC, New York YC and the Royal Yacht Squadron for this prestigous biennial team-racing regatta. Members are invited to come along and watch the racing at Queen Mary Reservoir or join in the socials. Places are limited, booking early is advised. We’ll help with crew searching and putting people together, so don’t worry if you’re not already part of an established, well-oiled crew! Each team shall have a minimum of one member of each gender. The Autumn Excuse marks the end of the sailing season and the start of winter pursuits. A weekend where members sail, shoot and play golf. Sailors will start in Cowes and then the partakers of each discipline will converge on the Royal Solent Yacht Club at Yarmouth for dinner on the Saturday night, finding their way gently home on the Sunday . Click here to view the new Club prix fix menu. This menu will now change in the Coffee Room fortnightly. Members are reminded that the generous 20% discount on food and beverage expenditure in the Coffee Room and bars will be continue for those with a monthly account which will continue to offer great value. The Yacht Club de Monaco is very proud to open its doors to an exclusive concerts to RTYC Members. Duran Duran is coming to play in Monaco, live from the YCM Marina for your pleasure and highest enjoyment on Friday 8th September 2017 evening. Places will be sold on a first come first served basis. Click on the image to see ticket price options and more. This month’s refurbishment works are proceeding on schedule and Members are reminded that the Clubhouse will re-open fully for normal business on Tuesday 29th August. Two RTYC teams joined other teams last Friday to pedalo around the Isle of Wight to raise money for Wet Wheels, a charity enabling disabled & disadvantaged people to safely enjoy boating and the sea. Tom Montgomery captained one stint, along with Alexandra Montgomery, Huw Turner and Edward Wilton, followed by Sam Cook and his team comprising of Charlie Hagan, Adam Ramlugon and Mark Needham. Click here to read the report on RTYC Members preformace in Cowes. Photo Riff Raff skipper, Freddie Peters © Paul Wyeth. Click here to view What's on in the Coffee Room and Clubhouse from September. Bookings are advised the monthly themed evenings. Please see flyer for more details. Click here to view some photos from the Cowes Week Cocktail Party. Thanks to Sportography.tv for thier efforts and hard work over Cowes Week, capturing some fantastic shots. Click here to read the final report on the Gertrude Cup. Members are reminded that the Clubhouse will be closed for normal business from 4pm on Friday 4th August until 9am on Tuesday 29th August. Limited bed and continental breakfast will be available during this time when most of the staff will be on leave. Scuttlebuitt's report on the Panerai Classics Week, concludes, the Per Ardua Ad Mare Trophy, for the Overall Winner, was presented to Cuilaun, a 1969 George McGruer ketch which has been owned by RTYC member Brian Smullen for all of her 48 years, and is still as handsome as the day she was launched. Cowes Cocktail Party Tickets - Don't Forget to Book! This year's Cowes Week Cocktail Party is back at Commodore's House on Sunday 30th July. With free flowing Montaudon champagne and delicious canapés, this is a party you should not miss! Tickets are £45 and the restriction on the number of Members’ guests is now lifted. With capacity limited to 200 you are advised to book as soon as possible. Its the weather for Pimm's. No better spot to enjoy one than on the Clubs deck. Ask for the Bar menu if you fancy a snack. Summer Buffet Lunch - available every Tuesday and Thursday. Summer Buffet is soon to arrive in the Coffee Room. Fancy something lighter for lunch? Indulge in a range of healthy salads and meats. Availalbe every Tuesday and Thursday. Starting on Tuesday 6th June untill 4th August. Click here to view the flyer. Adam Gosling with member Ben Field who won the Gold Roman Bowl for the fastest corrected time in his JPK 10.80 Yes! Lord Laidlaw who won the Silver Roman Bowl and the cup for the first monohull to finish in his Reichel Pugh 82 Highland Fling X1. Bernard Langley, son of Tony Langley who was the second monohull to finish and 3rd on line honours. Sir Keith Mills and his son Alex won the Fast 40+ class in Invictus. And to the many members who achieved their own personal goals and took part in one of the biggest sporting events in the UK. On Saturday the Fifth Younger Member's Solent Weekend kicked off with an early start out of London. As the train got nearer to Southampton the hits on the Bramblemet website soared as we all checked the live weather to see a consistent 20kts gusting over 25kts (and a distinct absence of the 30 degree sunshine we’d seen all week from our desks in London!). Under the instruction of the Race Committee all six J70s filled with a mixture of new, potential and regular YMs, set off to a windward leeward course within the protection of Osborne Bay. 16 yachts of all sizes and a Committee Boat kindly provided by new member, Nick Agar, booked in for the annual Cumberland Regatta, the premier RTYC cruising event of the year, all was set for a fun event of competitive sailing and enjoyable socials. Click here to read the Aspirin Trophy report. Prince Philip's Cup was presented by Prince Philip in 1956 as a contest to encourage sailing and social contact between clubs located on the Isle of Wight. Originally, it was raced for in Cowes, was then moved to Bembridge, and finally came to Seaview in the late 1980's. Over the past ten years, nine different clubs have emerged victorious showing that if you enter you stand as much chance as anybody else of walking away with the cup. This year, as in recent years, Sea View Yacht Club invited not only Island Yacht Clubs but also mainland yacht clubs that are involved in organising yacht racing on the Solent. Click here to view the RCYC Sailing League Report. Please see here entries confirmed to date. Please click here for joining instructions, to enter your yacht please click here. Members who wish to attend the Annual Dinner of the Cumberland Sailing Society on The Platform at the Royal Yacht Squadron, please click here. The Royal Thames Academy finished 5th overall, and first Corinthians, at the 2017 J/70 European Championships, hosted by the Royal Southern Yacht Club on an unusually angry Solent. The young team from the Royal Thames YC Academy, skippered by Tim Gratton, and helmed by Fiona Hampshire, was the top Corinthian J/70, placing an impressive 5th overall. This was to be the third Regatta as organised by GSYS. Click here to view the RTYC invite. We are delighted to invite you to take part in our first ever Salsa Dancing Class! For more information or to book please contact Charlotte in the Secretariat on 020 7201 6263. A Royal Thames Academy team consisting of Tim Gratton, Josh Flack, Fiona Hampshire and Duncan Yeabsley competed in the J70 Southern Area Championships over the weekend of 20-21 May. The Royal Thames Yacht Club created and hosted for the second time the Southern Area Championships for the J/70 class to be held over two days in the Solent. 22 entries confirmed the high interest in the event which promised 4 races a day and a paella supper in the Sugar Store at Shepards Wharf to bring the class together socially after racing. Enjoy an Italian themed menu in the Coffee Room from monday 15th - 19th May. Click here to view the menu. Two Royal Thames Academy teams travelled north to compete in the 2017 edition of the Wilson Trophy over the weekend of 5th - 7th May. Click here to view the Clubs exciting new Bar Menu. Enjoy the Mayflower cocktail for the month of May. A taste of good things to come. A team of Royal Thames Academicians finished second at the inaugural Ravenna stop of the European 2K circuit. Click here to read the full report. Are you going to the England v Ireland on Monday 29th May? Why not take advantage of our weekend accommodation offer of 2 nights for £100 for two people. Members are reminded that the Clubhouse will be closed on the Bank Holidays on 1st and 29th May with Bed and Breakfast facilities available as normal. There will be no Sunday Brunch Sunday 30th April and Sunday 28th May. The Club will be open for accommodation and breakfast service over May Bank holiday weekends. For bookings please contact reservations. Click here to read the match report on RTYC at the Baldwin Cup. Offer The Club is in excellent shape but could accommodate and benefit from more Members. Existing Members are encouraged to take an active approach to introducing suitable new Members. To help this, for a limited period only the Club will offer Proposers and Seconders of new Members some valuable complimentary dining at the Club. This was a rescheduled event from the 12 March when a lack of wind forced a postponement. 6 of the 8 finalists were able to attend the new date and arrived to an almost perfect Queen Mary weather: 10 knots of breeze and sunshine. The RO team led by Jo Lucas supported by the Umpire team led by Chris Simon set up the racing very promptly to capitalise on the conditions and 15 flights were run in quick succession. Explore the Mediterranean diet with our very own Food and Beverage Manager, Thore. The food is full of flavours and colours. Taste various styles of Spanish Tapas accompanied by a glass of wine. Click here to view the flyer. Click here to book or contact Charlotte. Spoil your Mother at the Royal Thames Yacht Club this Mother's Day with an afternoon tea. The Club has been given the opportunity to acquire an important silver trophy, originally presented as a prize for the winner of a Royal Thames regatta in 1913. Click here to read the Curator of Trophies note on this item and the request for donations to help fund the acquisition. Enjoy a slow cooked Irish stew in the Britannia Bar and in the Coffee Room on Thursday 16th and 17th March. Click here to view the flyer. Bookings to made through reservations. Opera Tasting Night - Wednesday 26th April - BOOK NOW! Come and join us at the first ever Opera Tasting Night at the Club on Wednesday 26th April. Tasting notes: Join Samuel Sakker (tenor) of the Royal Opera and Charles Johnston (baritone) of Welsh National Opera in an evening of fragrant and intoxicating favourites, lifted from the extensive cellars of the world of The Lyric Theatre. Served up with a delicious three course meal. Enjoy a range of new cocktails in the Britannia Bar and Quaterdeck. Click here to view the Menu. A full complement of eight highly competitive teams arrived early at Queen Mary sailing club on Saturday 14th January for the annual Royal Thames Carmela Cup – The RYA Open Two Boat Keel Boat Championships. A team of Cambridge Alumni (Royal Thames Blue) were victorious in the 17th Cam Cup held at Grafham Water on 18/19 February 2017, with Cambridge Blue finishing runners-up. Enjoy some of the finest cuisine Norway has to offer in the Coffee Room from Monday 20th to 24th February. Bookings are advised. Please contact reservations or on 020 7235 2121. Having taken place for the first time last year, the British Keelboat League is back and will be even bigger and better. Following on from the success of its first full season last year, the RYA will again partner with the Royal Thames Yacht Club (RTYC) to run the 2017 British Keelboat League bringing the exciting, high-speed format to new venues and providing even more opportunities to take part. The Wessex Winter Warmer over the weekend at Spinnaker SC. The RTYC Blue Team dominated the event (RTYC members Arthur Henderson & Francine Counsell, Josh Flack & Lilly Carlisle, Fiona Hampshire & Honor Fell). 8 teams assembled at Queen Mary Sailing Club for the second heat of the random pairs two boat team racing for RTYC members (without spinnakers). Enjoy a Valentine's Day Dinner in the comfort of your very own Club, overlooking the tranquillity of Hyde Park. Start with a glass of champagne on arrival. Click here to view the menu. *Member's discount does not apply to this special offer. Britain’s sailors concluded their first World Cup regatta of the 2020 cycle with a six-medal haul as the Sailing World Cup Miami drew to a close on Biscayne Bay on Sunday (29 January). Gold for Dylan Fletcher-Stuart Bithell (49er) and a British 1-2 in the Nacra 17 event from Ben Saxton-Nicola Groves and Tom Phipps-Nikki Boniface on Saturday were topped up with two further silver medals and a bronze from Sunday’s second day of medal racing. Click here to view pictures from Burns Night on Thursday 25th January. In the depths of Winter our next tasting of wines from Spain, with Jacquie Kay of Berkmann Wine Cellars, will range from a hearty red from Bierzo to a fresh summery Godello from Galicia. Tickets are £20 pp, and as ever, we look forward to seeing you in the Coffee Room afterwards. For more information click here or to book contact Lucia in the Secretariat or on 020 7201 6267 . Members are requested to note that the Model Room will be closed from 1700 – 1830 on Wednesday 25th January for a photographic session to update the pictures for the next edition of the Model Room catalogue. We apologise for this brief inconvenience. Popualr as ever, Curry Night is back in the Coffee Room. Click here to view the menu. For bookings please contact reservations; or on 020 7235 2121. Enjoy a Japanese themed Menu in the Coffee Room this Thursday. Click here to view the menu. During Cowes Week, the Royal London Yacht Club requires non-member guests to purchase and display Visitors Passes. However, Royal Thames members, as Full reciprocal members of the Royal London, are not required to purchase or display such passes when using the Royal London’s facilities but are, as usual, required to have their RTYC membership card available for presentation on request.